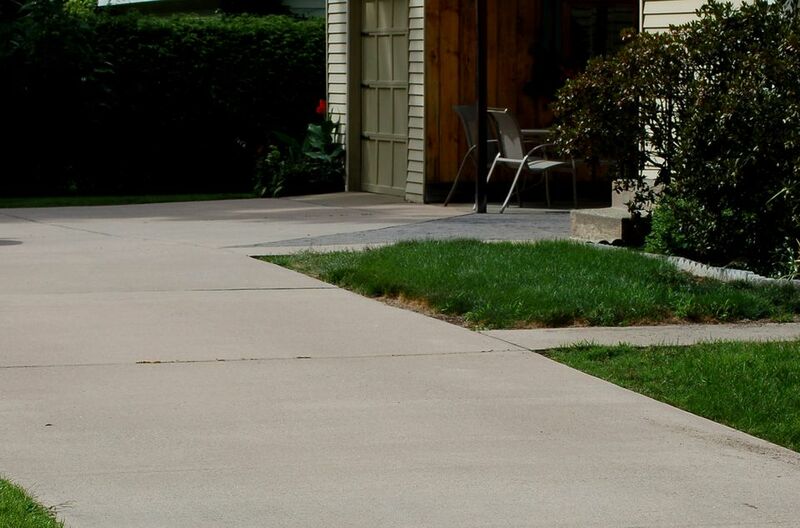 There is considerable debate about if it is necessary to apply a sealer to concrete driveways and other concrete surfaces, and if so, how often it should be done. Aggressive marketing by the companies selling sealing products may be the reason behind the common belief that a sealer must be applied each and every year, but even skeptics agree that periodic sealing will help prolong the life of any concrete slab, whether it is a driveway, patio, pool deck, or sidewalk. Concrete performs quite adequately if it is never sealed at all, but applying a good quality sealer every few years will extend its life and keep it looking good. This is especially true if you have a stained or etched concrete driveway or patio, or if you live in an area where winter road salt can eat away at the concrete. This is a very easy project for a DIYer, and it will keep your concrete slabs looking good and help them last longer than unsealed slabs. Acrylic-resin based sealers. Sealers that lay down a film of acrylic resin provide excellent performance for their cost. They may be blended with epoxy, polyurethane, or silicone to enhance the durability of the product, so read labels carefully. There are different types of acrylics, too, and some are better than others. Styrene acrylic is a lower-performance product that may turn yellow under direct sunlight. A better choice is a type known as virgin or pure acrylic resin, which will last longer and won't yellow. Epoxy or polyurethane sealers. These cost considerably more than acrylics, but the high costs don't really mean they are superior. They lay a thicker layer, so can be slippery, especially when coated onto a patio or walkway. These products also prevent the concrete from "breathing" moisture out of the concrete, which is a problem. If concrete does not breathe, it may cause a white haze to form between the concrete and the sealer layer. Penetrating sealers. These products are made of specialty resins (silicones, siloxanes, and silanes) that penetrate into the concrete and form a chemical barrier to water, oil and other common contaminants. Such products will be clearly labeled at "penetrating" sealers, and are a good choice where you want to protect surfaces against stains, such as in a garage or on a driveway. The very best products will be available at professional concrete supply retailers. The inexpensive products offered at hardware stores and home centers tend to be intermediate-level sealers that provide adequate performance but will likely have a shorter useful lifespan than more expensive professional-grade sealers. Like paints, concrete sealers are available in different gloss, or shininess levels. You can choose from no-gloss, matte, satin, semi-gloss, gloss, and high-gloss options. Manufacturers categorize glosses on a scale of 1 to 100, with 100 representing the highest level of gloss. Solvent-based sealers have gloss level of 800 to 100, which produces a gloss to high-gloss surface. Water-based sealers generally have a gloss of 50 to 80, producing matte or semi-gloss surfaces. Penetrating sealers have gloss rating of 0—a no-gloss surface. Be aware that solvent-based sealers tend to darken the surface of the concrete more than do water-based sealers. Those marketed as "wet-look" sealers have a higher ratio of solids in the liquid. While some people like the look of wet-look sealers, others find them unnatural looking, especially on stamped, colored, or textured concrete surfaces, such as are often used on patios and pool decks. However, some wet-look sealers also include coloring agents that can be used to stain a slab as well as seal it. Much of the work involved in sealing concrete driveways is preparation—both of the slab itself and yourself. Before sealing concrete, make sure the surface is clean and dry. If necessary, use soap or degreaser to thoroughly clean the slab. Any patching that's required should be completed before sealing. Clean, dry surfaces are critical in order for the sealer to properly adhere to the concrete. Sealers are not substances you want to contact your skin or eyes, so make sure to wear gloves, long sleeves and trousers, and eye protection when applying them. Before beginning, read label directions for any cautions. Concrete sealers can be applied by roller or with a sprayer, depending on the product. Refer to the manufacturer's label instructions for the recommended method. Generally speaking, solvent-based (oil-based) sealers are best applied by spraying, while water-based sealers are better applied with a roller. With either method, strive for complete coverage. Most products are rated to cover 250 to 300 square feet per gallon. It's best to apply two or even three thin coats, allowing each coat to dry between applications. This will prevent puddling that can create uneven coverage. Overlap the areas as you apply the sealer to ensure full coverage. It's best to work on one small square section at a time, no more than about 25 square feet (a 5 x 5-ft. section) rather than working in narrow strips. Apply the sealant in thin, overlapping coats with a long-handled application brush or squeegee. Drying time is about 2 hours, but this can vary depending on weather conditions. Humid summer conditions may require a drying time of 5 or more hours. The entire surface should be dry to the touch without any sticky feel before you apply the next coat. Once your driveway is sealed, regular maintenance will keep the sealer coat doing its job. Simple cleaning every few months with soap and water is a part of this routine. If you notice areas that have worn thin, a light re-application after washing is a good idea. Opinions vary regarding how often a concrete driveway should be resealed. This depends partly on the product used, as well as on the weather and level of wear and tear on the slab. The quality of resins in the sealer will greatly influence the lifespan of the seal coat. According to concrete trade organizations such as Concrete Network, you should plan on resealing every 1 to 3 years.